The Elliott Family live near school in Rancho Santa Fe. Find out what they like about living in the area. 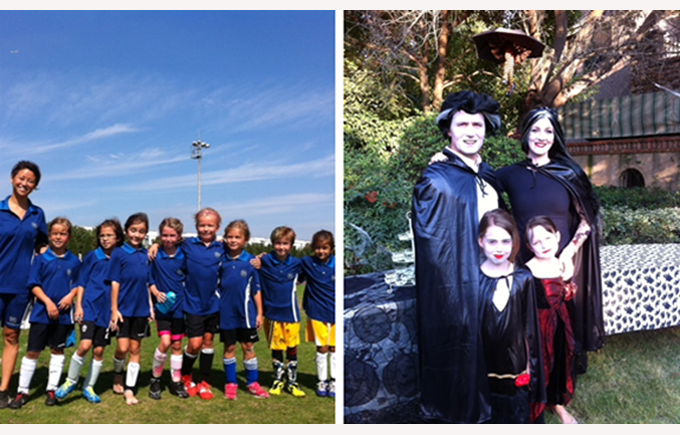 The Elliott Family at the Halloween lawn party that they hosted this year and Grace's Sunday soccer team. Hi my name is Emma and my kids are Grace who’s 9 and Sophie who is almost 7. We are from the US and have been living in Shanghai for a year and a half. Which compound do you live in and why did you choose it? We live in Rancho Santa Fe. It was a seamless transition for the girls as it looks just like the US! They can ride their bikes and climb trees outside, whilst I sit in the front lawn during the summer. We can do all the things we used to do at home which is great for all of us. What do you like about Huacao area? It has everything we need locally, including supermarkets, restaurants and entertainment. It's a real community that we really enjoy being a part of. We do sport on Saturday and on Sundays there is Gracie’s soccer tournament and then we often go for brunch. In the city we like Green & Safe for brunch. Locally we like going to Baker & Spice. Our favourite family activity is watching our daughter's playing soccer on a Sunday. What’s your children’s favourite restaurant? Baker & Spice or Pizza Express.